Apple has made its 2016 MacBook Pro official. Here are its specs, price, release date info. In short, here’s everything you need to know about Apple’s latest MacBook Pro. We’ve been hearing about the latest addition to the MacBook Pro range for a while now, but finally, Apple has announced the new hardware at its dedicated Mac event held in its iconic Cupertino campus. The MacBook Pro has been long due for a refresh not just under-the-hood, but aesthetically as well, especially when you consider the beautiful 12-inch MacBook model that has been around since 2015. The 2016 MacBook Pro comes in 15-inch and 13-inch sizes, and takes its cues from the evolutionary design choices that Apple has taken last year with MacBook, and complements that with the addition of some truly revolutionary features giving the ‘Pro’ moniker something to actually stand proud by. Now that Apple has taken the covers off of its new computing machine, all those earlier rumors and speculations have finally been laid to rest, with the real concern being how, and when will fans be able to put their hands on one. We take a look at all that makes the new MacBook Pro special, when can customers expect to grab one, and at what price. So without further ado, let’s get down to the intricacies of this announcement. As expected, the new MacBook Pro is immediately recognizable as one of Apple’s notebooks, but does come with exterior changes that will appeal to potential owners and differentiates it from previous-gen MacBook Pro design which has been around since 2012. It is also slimmer and lighter than its predecessor. Apple says that 15-inch MacBook Pro is 14% thinner and is also 20% more compact than before. The 13-inch model is 17% thinner and 23% less in volume compared to the previous gen. MacBook Pro. The display is Retina of course, but comes with serious bunch of improvements. The new MacBook Pro now boasts a display that is 67% brighter, packs 25% more colors, and has a 67% higher contrast ratio than before, sporting same Retina resolution as before. The new MacBook Pros are also the first Mac notebooks to support wide color gamut (P3). This is definitely one of the highlight features of the new MacBook Pro, and definitely one thing that will ensure it moves off shelves in droves. Called the Touch Bar, the new MacBook Pro offers a touch-sensitive toolbar on the top of the keyboard that allows different function keys and shortcuts to be mapped around for that ultimate dynamic approach. The keys and content here contextually change depending on the first or third party app being used, and can also be customized. More spectacular is the fact that the display on the Touch Bar is Retina, and it also employs the ability to detect multi-touch. You can learn about Touch Bar in detail here: How MacBook Pro Touch Bar Feature Works And What You Can Do With It. It’s been a staple part of Apple’s iOS-powered devices for a while, but now it makes it debut on the Mac. 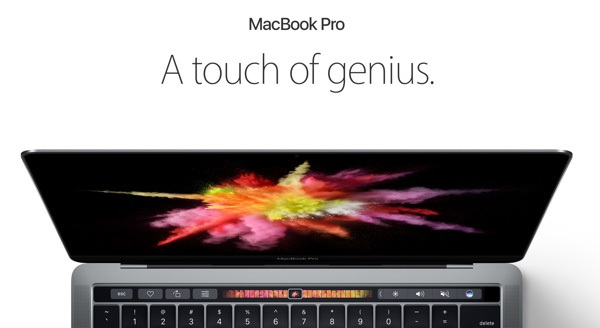 With this latest MacBook Pro, hardware owners are finally able to authenticate and verify themselves with biometrics via an integrated Touch ID sensor built right into the power button that resides on the right side of the Touch Bar. The Touch ID sensor is covered by Saphire crystal, and packs built-in Secure Enclave, just like Apple’s modern iOS devices. It can, of course, also be used for Apple Pay on the web. 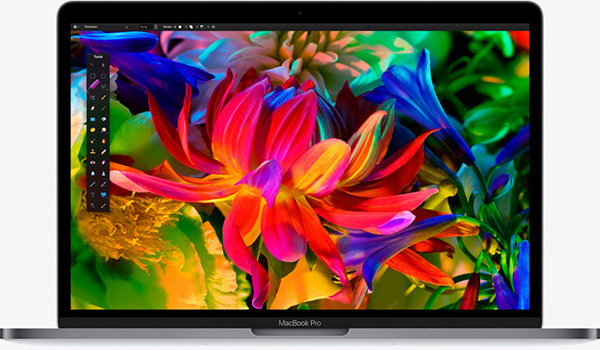 The new MacBook Pro features sixth generation Intel CPUs. With the top-of-the-range 15-inch model, we are looking at 2.9GHz quad-core Intel Core i7 processor with Turbo Boost up to 3.8GHz, an AMD Radeon Pro 460 GPU with up to 4GB VRAM, and 16GB of RAM. All of this makes for working with 3D graphics: 130% faster, gaming: 60% faster, and video editing: 57% faster than before. There’s a whopping 2TB SSD option available as well for the top-end model. SSDs in the new MacBook Pros are 50% faster than previous-generation models. The 13-inch model on the other hand comes in both Core i5 and i7 configurations with top of the line model maxing out with 3.3GHz dual-core Intel Core i7 processor, Turbo Boost up to 3.6GHz, and Intel Iris Graphics which are x2 faster than before. Memory on this version is configurable between 8GB and 16GB RAM and SSD options are available from 256GB up to 1TB max. This makes the machine 103% faster at gaming, 76% faster at video and graphics editing. 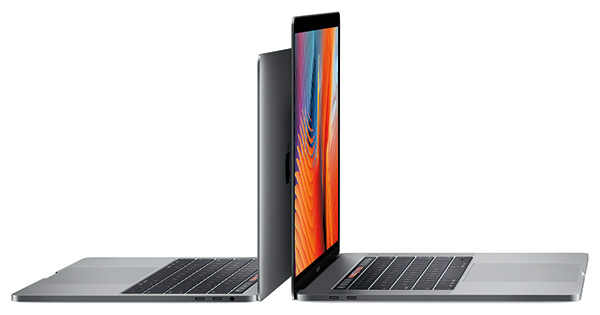 As was expected, Apple has continued its adoption of USB Type-C by integrating the connector into both the 13-inch and 15-inch MacBook Pro. This time though, while the connectors are of USB-C, the ports are actually Thunderbolt 3 supported. What this means is that they can handle power, HDMI, DisplayPort, VGA, Thunderbolt, USB and more all from this connection. There are now 4 of these ports available on the new MacBook Pros with Touch Bar and Touch ID. Apple also has a 13-inch 2016 MacBook Pro model without Touch Bar and Touch ID (more on this model is detailed here), on which only two of these Thunderbolt 3 ports are available instead of four. You will be happy to see speakers getting some focus this time around. Apple says that the speakers in the new MacBook Pro range now offers 2x the dynamic range compared to previous model. The keyboard on the new MacBook Pro now employs the a 2nd gen. butterfly mechanism. The keyboard is LED backlit of course, but this time with each key independently lit up. This isn’t exactly a new feature, but is one that continues to push forward the appeal of the MacBooks, and even more so this time around with a Force Touch glass trackpad that boasts a surface area that is 2x larger than before, for that precision input and interaction than before. The battery in this year’s MacBook Pro should be good enough to offer that “full day” experience with up to 10-hours of continuous operation, based on full charge and under optimum operating conditions. This may not be the greatest part of what Apple has introduced with the new MacBook Pro, but yes, it does come in those multiple, and very familiar, color options. Prospective owners can choose between Space Gray and Silver colors. And this is where the good news gets even better; Apple is taking immediate orders for the new MacBook Pro starting today, with the 13-inch MacBook Pro without Touch Bar and without Touch ID being available for shipping starting today. 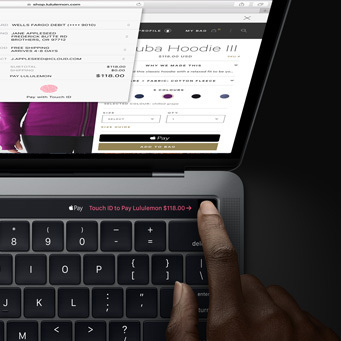 The 13-inch and 15-inch MacBook Pro with Touch Bar and Touch ID ship out in 2 to 3 weeks time. Yet again the ports have been severely crippled! I hear it is to be only four USB-C for power and another round of adapter purchases. WTF Apple, this is your flagship laptop! 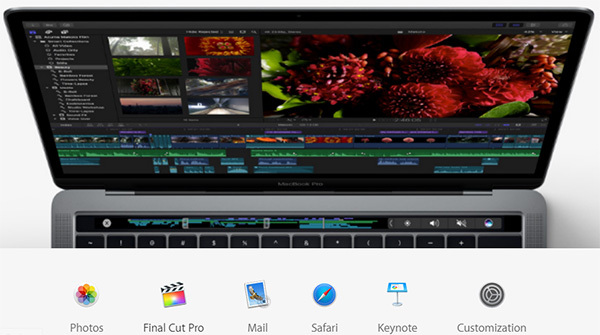 where you can have a floating touchbar!! The fully loaded MacBook pro will cost around $4300! When they install these chip it’s integrated so the 7th gen wasn’t available for mass production. Had to used what they had when they made these right onto the motherboard. Sata II SSD (3.1 3Gb/s) in all configurations in 2016 ? True I love what apple is doing here. I no for a fact they the function keys has been there forever and almost to an average user no one uses it. Mayb F5 lmao. A touch bar and you can customize the way you want would be awesome!! Great way for every other manufacturer to copy on lmao. Yeah, but the more important thing is that it’s thinner. And I was just considering getting a 15″ MacBook. But virtual Fn keys is a disaster for programming. So, maybe another time. DDR3 only up to 16GB of Memory? Are you kidding me Apple? !